Teachers and students say the anti-immigrant, anti-Muslim rhetoric on display during this year's election campaign appears to have seeped into the classrooms, creating a new level of fear and anxiety among students of color. At a middle school in Tukwila, Washington, one of the most diverse schools in America, students say they've seen a different kind of bullying arise this year. A Muslim eighth-grader says other kids, including some who were her friends, have called her a terrorist. That's not something she's heard until this year. An Hispanic student who was born in the U.S. says he's been told to "go back to the border" and "it's not right for you to be here." "These are things that we hadn't been hearing before. Our population hasn't changed. So what seems to have changed, to me, is the political rhetoric," said Debbie Aldous, a teacher at the school. There's always been bullying, but this new tone is something teachers across the country are seeing more recently. More than two-thirds said they've seen an increase in anti-Muslim or anti-immigrant sentiment since the beginning of the presidential campaign, according to a survey conducted in March by the Southern Poverty Law Center. The survey didn't ask about the rhetoric of specific candidates, but 1,000 comments received from respondents mentioned Trump. Fewer than 200 mentioned Hillary Clinton by name. To be sure, these ideas and feelings pre-date Trump's campaign, during which he's spoken of deporting millions of immigrants, building a wall along Mexico's border, and banning Muslims from entering the country. His candidacy has "made lots of people and their kids feel more free to express certain bigoted ideas," said Jonathan Zimmerman, a professor of the history of education at the University of Pennsylvania. "But at the same time, I think it's dangerous to attribute this solely to Trump or to blame it only on his supporters," he said. Even if teachers don't bring up the specifics of the campaign, kids are talking about these issues. "I just feel weird inside. Scared with a mix of frustration and anger," said Jose Rios, whose parents are from Mexico. "The people who agree with Trump, they don't know the feeling to hear 'go back where you came from,'" he said. Shukri Diriye's parents are immigrants from Somalia who fled the civil war. 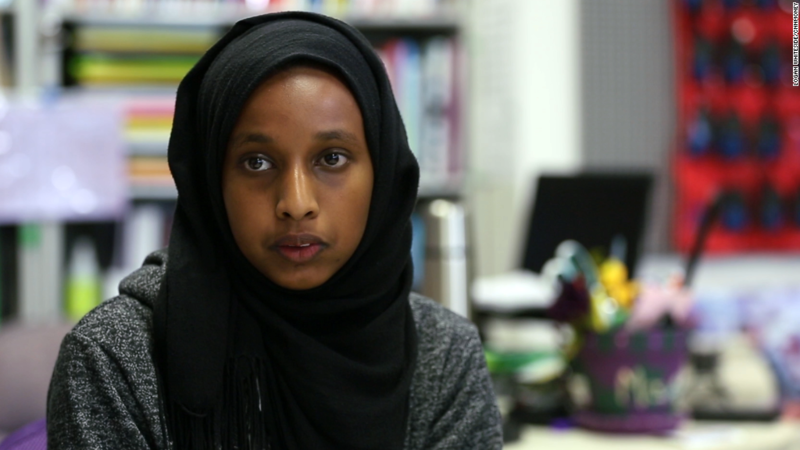 She was born here in the U.S., but when she hears other students call her a terrorist, it sometimes makes her question whether she does deserve to live in this country. "If Somalia never had a civil war, I wish I could have just stayed there with people that look like me, so I wouldn't be the different person," she said.